Players assume the role of a Guardian, protectors of Earth's last safe city as they wield a power called Light to protect the Last City from different alien races. One of these races, the Cabal, led by the warlord Dominus Ghaul, infiltrate the Last City and strips all Guardians of their Light. The player sets out on a journey to regain their Light and find a way to defeat Ghaul and his Red Legion army and take back the Last City. Like the original Destiny, the game features expansion packs which further the story and adds new content and missions. Year One of Destiny 2 featured two small expansions, Curse of Osiris in December 2017 and Warmind in May 2018. A third, large expansion, Forsaken, was released in September 2018, beginning Year Two with an overhaul on gameplay. The base game and the first three expansions were packaged into Destiny 2: Forsaken Legendary Collection. Upon release, Destiny 2 received generally favorable reviews from critics. The game received praise for its many improvements over its predecessor. The original Destiny received much criticism for its story, but Destiny 2 was praised as having a "more robust story" and an actual fleshed out villain. As with the original, gameplay for the most part was also highly praised. Reviews were split on the recategorization of the weapons and the newer activities like the Adventures and Lost Sectors, but praise was unanimous on the exploration of the game world. Changes to PvP were welcomed by some reviewers, though others were critical for the mode lacking player choice. Destiny 2 was nominated for and won various awards, such as at The Game Awards 2017 and Game Critics Awards. Destiny 2 allows players, known in the game as guardians, to utilize weaponry and special powers alongside other guardians. Here a guardian defends against enemies while another guardian uses their powers to cast a shield made of void energy. Similar to its predecessor, Destiny 2 is a first-person shooter game that incorporates role-playing and massively multiplayer online game (MMO) elements. The original Destiny includes on-the-fly matchmaking that allowed players to communicate only with other players with whom they were "matched" by the game. To communicate with other players in the game world, players had to use their respective console's messaging system. Destiny 2 features a more optimal way of matchmaking called "Guided Games", which allows players to search for clans who may need additional players for activities, such as strikes or raids. Like the original, activities in Destiny 2 are divided among player versus environment (PvE) and player versus player (PvP) game types. As in the original game, players are able to improve their characters, referred to as Guardians, by gaining experience points (EXP) — when a set number of experience points are accumulated, the player's character will "level up" and gain improved statistics which further enhance performance in battle. Milestones, including the "main scenario" milestones, are specific tasks given to the player by non-player characters (NPCs) which reward items and EXP. Completing main scenario milestones progresses the overarching plot of the game. Destiny 2 features the same three character classes as the original Destiny. Each class has their own specific upgrades, perks, special abilities, and three sub-classes that allow players to finely tune their individual characters to provide a different play style. The three classes are Warlock, Hunter, and Titan. After choosing a class, players select one of three species for their character: Human, Awoken (bluish-gray-skinned descendants of Humans), or Exo (humanoid machines). They can then customize their character, such as changing its gender or skin color. A character's species is cosmetic and does not affect gameplay. Players can create two more characters to have a character of each class. Hunters continue to have access to the Solar-based "Gunslinger" sub-class from the original game and the Void-based "Nightstalker" sub-class from the original's The Taken King expansion, both with gameplay changes. The Hunter's new sub-class for Destiny 2 is the Arc-based "Arcstrider", replacing the "Bladedancer" sub-class of the original. Arcstrider's super, "Arc Staff", focuses on an electrified staff and a large amount of rapid mobility. Forsaken adds three new supers for each of the Hunter sub-classes: "Blade Barrage" for Gunslingers, focusing on throwing a volley of flaming knives; "Spectral Blades" for Nightstalkers, allowing players to see through walls and attack with Void daggers; and "Whirling Guard" for Arcstriders, which allows players to block projectiles by spinning their Arc Staff. Warlocks continue to have access to the Void-based "Voidwalker" sub-class from the original game and the Arc-based "Stormcaller" sub-class from the original's The Taken King expansion, both with several changes. The Warlock's new sub-class for Destiny 2 is the Solar-based "Dawnblade" with a super called "Daybreak", replacing the "Sunsinger" sub-class of the original. The Daybreak super allows the player to make Solar Light blades to strike enemies from mid-air. Forsaken gives Warlocks three new supers: "Nova Warp" for Voidwalkers, allowing players to warp around the battlefield and unleash a Void explosion; "Chaos Reach" for Stormcallers, which unleashes a beam of Arc energy which can be turned off at any time to conserve Super energy; and "Well of Radiance" for Dawnblades, allowing players to create a healing and empowering aura for players to stand in. Titans continue to have access to the Arc-based "Striker" sub-class from the original game and the Solar-based "Sunbreaker" from the original's The Taken King expansion, both with significant gameplay changes. The Titan's new sub-class for Destiny 2 is the Void-based "Sentinel", replacing the "Defender" sub-class of the original, although the Sentinel sub-class can create the Defender's Ward of Dawn shielding bubble if this option is selected. Sentinel's super, "Sentinel Shield", allows the player to summon a shield that can block enemy fire and be used offensively (similar to Captain America's shield). Forsaken will add three new supers for Titans: "Thundercrash" for Strikers, allowing players to launch into the air and slam onto the ground; "Burning Maul" for Sunbreakers, which players wield a large hammer than can unleash flaming tornadoes; and "Banner Shield" for Sentinels, which unleashes a protective barrier that allows other players to shoot through. Upon reaching the character EXP level cap (level 20 at launch, expanded to 50), character progression shifts to improving their "Power" level (formerly "Light" level) by acquiring new and better equipment. This equipment can be gained through a variety of sources, including "strikes", raids, and in-game events. The three weapon classes and five pieces of armor each have a Power level; a character's Power level is the average of that gear. A higher character level allows for better equipment with higher Power levels to be equipped. A higher Power level improves damage output and defense. The highest obtainable Power level at launch was 305 and is expanded to 600. Weapons and armor were reorganized in Destiny 2. In the original game, weapons were divided as Primary, Special, and Heavy weapons. At launch, the weapons were categorized as Kinetic, Energy, and Power weapons. Primary weapons and some Special weapons in the original - such as hand cannons and sidearms - are classified as Kinetic and Energy weapons. Those without an elemental damage type go in the Kinetic weapons slot while those with an elemental damage type (Arc, Solar, or Void) go in the Energy weapons slot. Power weapons include the Heavy weapons and the more powerful Special weapons from the first game, such as shotguns and sniper rifles, as well as new weapon types, such as the grenade launcher. As of Forsaken, the weapons system was overhauled, with many Power weapons, such as most shotguns, single-shot grenade launchers, and most sniper rifles, being reorganized into Kinetic and Energy weapons slots. With armor, the name of the stats have been changed. Instead of Strength, Intellect, and Discipline, there are stats for Resilience, Recovery, and Mobility. Also for armor, the helmet, gauntlets, chest, legs, and class item slots have remained unchanged, but the artifacts slot has been replaced with one for a player's clan banners. Like the original game, player versus environment game types make up the majority of the game. Areas to explore include Earth's European Dead Zone (which was only represented by PvP maps in the original), Saturn's moon Titan, Jupiter's moon Io, and the centaur planet Nessus. The Curse of Osiris expansion adds Mercury as an explorable area, while the Warmind expansion adds Mars. Forsaken adds two new explorable areas in the Reef: the Tangled Shore and the Dreaming City, the latter being the mysterious homeland of the Awoken race and an end-game area that is accessible after completing the campaign of Forsaken. There is also a new social space in the European Dead Zone called "The Farm", as the main portion of the Tower of the original was destroyed at the start of Destiny 2's campaign. However, a lower, undamaged portion of the Tower becomes the main social space post-campaign. Like the original, there are Patrol missions and public events, but emphasis has been placed more on exploration of the worlds, including towns that players can visit and friendly NPCs who can be found in-game and will give side-quests. New missions were added called "Adventures", which allow players to explore the area and go on a treasure hunt-like journey to dungeon-like areas. Some Adventures culminate in what is called a Lost Sector, which are somewhat hidden areas in worlds that lead players to a boss that yields rewards upon its defeat. Lost Sectors can be found and accessed without doing an Adventure. Starting with the Curse of Osiris expansion, Heroic Adventures were added, which are harder versions of Adventures and they rotate each week. A map has also been added to the game, which shows the locations of the NPCs, Adventures, Heroic Adventures, Region Chests, and Lost Sectors. The maps of these new areas are much larger than those in the original Destiny, with one being described as twice as large as any area of the original. Players no longer have to leave a planet and go to orbit to travel to another location; they can now do so immediately from their current in-game location. Another new activity has been added called Flashpoints, which is a weekly milestone that takes place on one of the eight locations and rotates each week. Players complete public events, loot Lost Sectors and complete Heroic Adventures to earn high level rewards. Similar to the original game, players can pledge their allegiance to one of three factions — Dead Orbit, Future War Cult, or New Monarchy. In Destiny 2, however, the factions now compete against each other in the Faction Rally, which is a periodic event that lasts for one week. Faction points are earned by doing various activities. The faction with the most points at the end of the week earns a high level reward for 1,000 Glimmer (in-game currency). The losing factions can also gain the reward, but must pay 50,000 Glimmer for their faction's item. Once a player has completed the main story and has reached the level cap (currently 50), they unlock access to different types of end-game content. These activities include Nightfall strikes (a weekly featured strike with modifiers and high level rewards; as of the Forsaken expansion, players can choose one of three featured strikes), a strike playlist with modifiers, a Daily Heroic Story playlist, the "Leviathan" and "Last Wish" raids, the "Eater of Worlds" and "Spire of Stars" raid lairs, and the "Escalation Protocol" and "Blind Well" horde activities on Mars and the Dreaming City, respectively, among other PvP activities. A harder difficulty mode called "Prestige" is available for the Leviathan raid its raid lairs, with modifiers; there are no plans for a Prestige mode for Last Wish. These end-game activities reward players with powerful gear upon successful completion to increase their Power level. Like the original, player versus player combat exists in what is called the Crucible with Lord Shaxx returning as its NPC. The original Destiny's Crucible featured six-versus-six and three-versus-three game modes, as well as a limited time two-versus-two mode. At launch, all game modes were four-versus-four as Bungie shifted their focus to smaller teams for competitive multiplayer and better map design, but Quickplay modes eventually became six-versus-six. Like the original, player statistics such as weapon power and defense are balanced between players in Crucible game modes. The in-game HUD was updated so that players can see if an enemy has their super charged or has power ammo. Players currently do not have the option to select a single game mode to play. Excluding Trials of the Nine and Iron Banner modes, Crucible features two options, quickplay and competitive. Quickplay rotates between three game modes from the original Destiny that were modified for the new player count: Clash, Control, and Supremacy; Supremacy was eventually moved to its own playlist in an update. Competitive rotates between Destiny 2's two new modes: Countdown and Survival, as well as four-versus-four versions of Control and Clash. "Countdown", a best-of-ten rounds mode, is "an asymmetric objective mode where players have to plant a bomb in the enemy base and then defend it until it explodes." One team attempts to plant bombs at designated locations, while the other team defends those locations to prevent bombs from being planted. If the opposing team plants a bomb, they must defend it until it explodes, while the other team attempts to defuse it. If the original defending team kills all players on the offensive team, the round is over, similar to the 'Search and Destroy' game modes from other first-person shooters. In "Survival", a best-of-seven rounds mode, a team has a certain number of lives that is shared across that team. If a player dies and their team's total lives is at zero, they cannot be revived for the remainder of the round. Trials of Osiris from the original game was replaced by Trials of the Nine. Like Trials of Osiris, Trials of the Nine begins on Fridays and ends with the weekly reset on Tuesdays. The game mode for this new Trials, however, has changed; instead of using the Elimination mode of the original, Trials of the Nine rotates each week between Destiny 2's two new game modes, Countdown and Survival. Only one map is featured for Trials' four-day duration, but the map also rotates weekly. Player's gear is locked during Trials, meaning they cannot change it for the duration of a match. Unlike Trials of Osiris, players can gain access to the Trials of the Nine's social space called The Spire, located in unknown space, for completing a match of Trials and earning Trials tokens. There, players will meet an NPC called the Emissary of the Nine, who will exchange tokens for gear. Gaining three, five, and seven wins on the score card, respectively, gains access to the upper tiers of the social space with greater rewards at each tier. Going flawless with seven wins allows admittance into an exclusive area with even greater rewards. Three losses resets the score card. To access Trials of the Nine, players must have completed the campaign, completed Lord Shaxx's "Call to Arms" milestone, and have a Power level of at least 260. The periodic competitive Iron Banner PvP mode of the original game, which disabled balancing of player's gear, also returned for the sequel. Destiny 2's Iron Banner, however, does not disable balancing, with Bungie stating that "Your fighting abilities, not your power levels, will decide the outcome". This was changed following the release of Forsaken, with balancing becoming disabled like the original game. Like the original, Iron Banner lasts for one week and features milestones to complete daily. Players must have completed the campaign and be level 20 to access Iron Banner, which features the returning Lord Saladin from the original game as its NPC. A new PvP mode that was added in the Forsaken expansion is called Gambit, a best-of-three rounds mode that combines both PvE and PvP, featuring the Drifter as its NPC. A 24-hour free trial of the mode was made available to all players on September 1, 2018, three days prior to the launch of Forsaken. Two teams of four players compete against each other by defeating PvE enemies. Enemies, when defeated, drop motes which players can pick up and deposit in a bank in the center of the arena. Depositing 5, 10 or 15 motes send small, medium or large enemy blockers, respectively, to the opposing team's arena and locks their bank; the opposing team must defeat the blockers in order to reactivate their bank. Every 25 motes deposited opens a portal where one team member can invade the other team's arena. Defeating members of the opposing team drops any motes that they are carrying. After depositing a certain amount of motes, a boss will spawn in the middle of the arena; if a team member is defeated by an invading member of the opposing team, the boss regains health. The first team that defeats their boss wins the round. One year after the SIVA Crisis, Cabal forces of the Red Legion launch an aerial assault on the Last City, destroying the main portion of the Tower, the headquarters of the Guardians. The player's Guardian and their Ghost respond by assisting the Vanguard in assaulting the Red Legion command ship. As they confront the Red Legion's commander, Dominus Ghaul, his forces attach a device to the Traveler and begin draining it of the Light, the power used by the Guardians. The Guardian loses their powers and is nearly killed by Ghaul. Waking two days after the attack, the Guardian locates their Ghost. They find a haven known as "the Farm" in the European Dead Zone (EDZ) with the assistance of Suraya Hawthorne, a non-Guardian human from the outskirts of the Last City. The Guardian follows a vision to encounter a shard of the Traveler hidden in a forest within the EDZ. Ghost interfaces with the shard and both its and the Guardian's Light are restored. After restoring long range communications, Hawthorne intercepts a distress call from Commander Zavala, urging surviving Guardians to travel to Saturn's moon Titan and assist in mounting a counter-offensive. Against Hawthorne's objections, the Guardian travels to Titan, which has been overrun by the Hive. With assistance from Deputy Commander Sloane, they learn that the Red Legion was dispatched to the Milky Way in response to a distress call sent during the Taken War two years prior, and that Ghaul possesses a superweapon known as the Almighty, a space station capable of destroying stars. Resistance to Cabal rule has resulted in entire star systems being destroyed. The intelligence also reveals that the Almighty is positioned near the Sun, breaking up the planet Mercury as fuel. Zavala tasks the Guardian to find Ikora Rey and Cayde-6 to assist in a counterattack to retake the Last City. During this time, it is shown that Ghaul, aided by his mentor, the Consul, overthrew Emperor Calus and took control of the Cabal, and has been studying the Traveler in order to learn how to use the Light and legitimize himself as Emperor. The Guardian locates Cayde-6 on the centaur planet Nessus, which has almost been completely transformed by the Vex. With the aid of Failsafe, an AI from the crashed starship Exodus Black, the Guardian frees Cayde from a Vex portal loop, and claims a teleporter for use in taking back the City. Cayde directs the Guardian to find Ikora on the Jovian moon of Io, where she had gone to find answers about the Traveler. Ikora and Io researcher Asher Mir directs the Guardian to locate a Warmind, an ancient defensive AI for intelligence on the Almighty. Afterwards, the Vanguard reunites at the Farm and conclude that the only way to retake the Last City and save the Traveler is to shut down the Almighty first, eliminating the possibility of it destroying the Sun. The Guardian boards the Almighty and destroys the weapon, signaling Zavala to begin the counterattack. As the Vanguard begins the assault, the Consul admonishes Ghaul for his obsession with the Traveler, and urges him to take the Light; Ghaul is reluctant until the Consul kills the Speaker, whom Ghaul had captured and tortured to try and learn more about the Traveler. Ghaul then proclaims that he will take the Light, and strangles the Consul in a fit of rage. The Guardian returns to Earth to assist in the counterattack and infiltrates Ghaul's command ship alone to save the Traveler. Ghaul forcibly takes the Light, corrupting it, and uses its power against the Guardian, but the Guardian is successful in defeating Ghaul. Ghaul reemerges as a massive ethereal figure who then speaks to the Traveler directly. In doing so, the Traveler wakes from its long sleep, destroying the device that was harvesting its power and killing Ghaul. It sends a massive shockwave, restoring the Light and decimating the Red Legion's forces. The game ends with a posthumous voiceover from the Speaker, reminding all that the Light can never be stopped. The Guardian and Ghost convene with Zavala, Ikora, Cayde, and Hawthorne at an undamaged portion of the Tower, with the Vanguard returning to their old duties and Hawthorne assuming a new post there. In a post-credits scene, the shockwave sent by the Traveler is shown reaching the entire system. The wave of Light extends beyond the Solar System and spreads beyond the Milky Way, before panning across a fleet of dark, unknown ships sitting some distance away in extragalactic space. Following Ghaul's defeat, a massive Cabal ship called the Leviathan appears in orbit of Nessus, under the control of the exiled Emperor Calus. Calus invites Guardians to complete a series of challenges before reaching his throne. A fireteam of Guardians complete his challenges before facing Calus himself; however, after overcoming his strange powers and defeating him, they discover that they were fighting a mechanical doppelganger. The real Calus speaks through the machine, claiming that what they know is a lie and that there is a truth beyond what the Speaker had told them. A sequel to Destiny was first mentioned in November 2014, two months after the original released, by Activision chief executive officer Eric Hirshberg, where he said "Work has also begun on future expansion packs as well as on our next full game release". Based on documents of the original release schedule for Destiny, Bungie and Activision intended to release new, disc-based sequels every other year until 2019, with large downloadable expansions in between. Originally planned for a September 2016 release (based on the original documents), Bungie confirmed on February 11, 2016 that a full sequel would release in 2017. That same month, video game writer Christopher Schlerf, who was the lead writer for Halo 4 and worked on Mass Effect: Andromeda, joined Bungie. In December 2016, Bungie announced that Vicarious Visions would be joining the development team along with Activision. Unlike the original, it was rumored that Destiny 2 would also release on Microsoft Windows, which was confirmed on March 30, 2017. ... we think we've made a sequel that's going to have a lot for them to love, too. The cornerstone of that is a great cinematic story that's been a real focus with a great cast of memorable, relatable characters, coupled with some very nice ways to make the game more accessible to a casual player. Without losing anything that our core players love, we've made it more accessible to someone who just wants to have a great, more casual first-person action experience. Bungie had said that players' characters and progression would carry over into future releases. However, this turned out to only be half true. Characters and progression did carry over into Destiny's expansions, but for the sequel, only players' characters' physical appearance carried over if they had reached level 20 and completed the Black Garden quest in the original. In regards to why progression and items did not carry over, Bungie said "We believe this is the best path forward. It allows us to introduce the major advancements and improvements that all of us expect from a sequel, ensuring it will be the best game we can create, unencumbered by the past." Bungie awarded veteran players in Destiny 2 with in-game emblems that acknowledged their accomplishments in the original Destiny. Players' characters, progression, and items are still accessible in the original Destiny, which will continue to remain online. 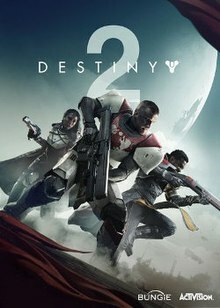 On March 23, 2017, a promotional poster for the sequel was leaked by Lega Network, revealing the game's name as Destiny 2 and a release date of September 8, 2017, with the mention of a public beta for the game. The poster showed that just like the original, Destiny 2 would have PlayStation exclusive content. On March 27, 2017, although not directly responding to the leaked information, Bungie tweeted an image of Destiny 2. The image showed The Last City in smoke and flames with "Destiny" and a large "2" over the Traveler. This was followed up with a teaser trailer narrated by character Cayde-6. The teaser showed the Tower under attack by the Cabal, one of the enemy races from the original game. PlayStation's YouTube channel showed a slightly extended teaser, officially confirming that there would be timed exclusive content for PlayStation 4, and it would last until at least fall 2018. A full reveal trailer released on March 30, showing the three class Vanguards, Commander Zavala (Titan), Cayde-6 (Hunter), and Ikora Rey (Warlock), rallying Guardians in the war-torn Tower. The Cabal are being led by Ghaul, the commander of the Red Legion. The trailers confirmed that Lance Reddick, Nathan Fillion, and Gina Torres would be reprising their roles as the class Vanguards, respectively. Nolan North also confirmed that he would be reprising Ghost, the Guardian's AI companion. Bungie had a live stream of Destiny 2's gameplay on May 18. On May 19, 2017, Destiny 2 project lead Mark Noseworthy told IGN that there were no plans for a Nintendo Switch version of the game. Noseworthy went on to say, "I think it's pretty unrealistic given we're an online-only game, right? The Switch, because it's a portable - and I love my Switch, I've got Breath of the Wild here, I've got it with me. It's incredible, I love the console, but in terms of where it's at, I don't want to leave anyone with the possibility of like, 'it's a thing we'll consider, maybe next year.' There's no plans right now for Switch." The Microsoft Windows version of Destiny 2 supports native 4K resolution and uncapped frame rate (fps), full mouse and keyboard support, text chat, adjustable field of view, and 21:9 monitor support, as well as being exclusive to Blizzard Entertainment's Battle.net service. Although not native 4K, Destiny 2 does support 4K enhancements for the PlayStation 4 Pro, an updated version of the standard PlayStation 4 that supports 4K rendering. Similarly, the Xbox One had an updated version called the Xbox One X that released in November 2017 after Destiny 2's launch. Bungie added 4K support for the One X, as well as HDR support for both updated consoles, on December 5, 2017. Unlike the Windows version, however, the console versions are locked at 30fps. Destiny 2 also has an improvement with its servers, which are a combination of dedicated servers and peer-to-peer networking. Lead engineer Matt Segur explained, "Every activity in Destiny 2 is hosted by one of our servers. ... That means [players] will never again suffer a host migration during [a] Raid attempt or Trials match. This differs from Destiny 1, where these hosting duties were performed by player consoles and only script and mission logic ran in the data center." Grimoire cards that were found in the original game, which detailed the lore of the Destiny universe and could only be accessed from Bungie's website and the Destiny app, did not return for the sequel. For Destiny 2, Bungie shifted their focus to in-game storytelling, which was something the original was criticized for lacking. To detail the lore of the universe in Destiny 2, there are many artifacts around the maps that can be scanned by Ghost, who will give details and backstory. Exotic gear and some legendary gear also have a lore tab. At the 2017 Electronic Entertainment Expo (E3), a new cinematic trailer was shown, narrated by the main antagonist, Dominus Ghaul. It showed that Bungie did focus more on the story for the sequel than the original, as Bungie was "attempting to go in-depth into the universe and the motivations of the characters." E3 2017 also revealed that Destiny 2's release date was moved up to September 6, 2017, and the Windows version was confirmed for an October 24 release. The dates for the beta on the console versions were also confirmed at E3 2017. Early access for pre-order customers began on PS4 on July 18 followed by Xbox One on July 19; non-pre-order customers received access beginning July 21. The console beta concluded on July 25, after a 2-day extension. The beta for the PC began on August 29 and concluded on August 31. The original score was composed by Michael Salvatori, Skye Lewin, C. Paul Johnson, Rotem Moav, and Peter Schlosser. When creating the music, the composers stated their goal with it was to "capture the somber spirit of a civilization confronting immense tragedy", and also to "inspire bravery in the hearts of our heroes as they stand together and fight to reclaim all that they hold dear". Destiny 2 was released worldwide for the PlayStation 4 and the Xbox One on September 6, 2017, and the Microsoft Windows version released worldwide on October 24. There were several editions of the game, including a Collector's Edition, a Limited Edition, a Digital Deluxe Edition, and the standard base game. Like the original, there is an Expansion Pass, which grants access to the first two expansions of Destiny 2. Also like the original Destiny, pre-orders for the game received early access to the game's beta, as well as other in-game pre-order bonuses, such as early access to the exotic rifle "Coldheart". Pre-orders from GameStop received a Cayde-6 collectible figure. Other figures and toys, such as Lord Saladin, were released after Destiny 2's console launch. The Windows version is distributed exclusively through the Blizzard Battle.net, marking the first non-Blizzard Entertainment title to be distributed via the platform. Even with the January 2019 announcement that Bungie and Activision have broken their publishing agreement, the Windows version of Destiny 2 will remain on the Battle.net platform. Per an exclusivity agreement with Sony Interactive Entertainment that began with the original Destiny, the PlayStation 4 version of Destiny 2 features timed-exclusive content until at least late 2018. The Collector's Edition of Destiny 2 included the base game in a SteelBook case, the Expansion Pass, a themed backpack, a "Frontier Kit", which featured a solar panel USB charger with built-in light, a paracord, and a solar blanket, a 15" laptop/tablet sleeve with protective pocket slip, a Cabal-themed collector's box with various items, and premium digital content. The Limited Edition, distributed exclusively from GameStop, included the same physical and digital items as the Collector's Edition, minus the backpack, "Frontier Kit", and laptop/tablet sleeve. The Digital Deluxe Edition includes all of the premium digital content. There was also a limited-time PlayStation 4 bundle that included a glacier white PlayStation 4 Pro, Destiny 2, the Expansion Pass, and premium digital content. Prior to the console release, Bungie said that they had already began working on post-release content. Bungie plans on providing post-release content at a quicker rate than that of the original Destiny, which was criticized for not having enough content post-launch and between each of its expansions releases. One of the team's remedies for this are the Adventures and Lost Sectors activities that were added to the free roam Patrol mode. Bungie also announced the Destiny 2 Expansion Pass prior to launch, which grants access to the first two expansions of the game. The in-game clan features became available a few days after the game's launch. The Guided Games feature became available on September 12 for the Nightfall activity, the game's first raid, "Leviathan", unlocked on September 13 (with the Guided Games in beta), and Trials of the Nine became available on September 15, along with the character Xûr from the original game, the exotic items vendor who only appears on the weekends. The three factions and their respective NPCs from the original game returned on September 26 for the new periodic event, Faction Rally. The competitive Iron Banner PvP mode from the original returned on October 10. The prestige mode for the Leviathan raid was originally scheduled to unlock on October 10, but was delayed to October 17. The game's first expansion released on December 5, 2017. Named Curse of Osiris, it focuses on the character Osiris from the lore of the original Destiny. The expansion takes players to the planet Mercury with its own patrol mode. Additionally, the EXP level cap was raised to 25 and the Power level cap was raised to 330. There is also a timed-exclusive Crucible map for PS4 players called Wormhaven. Instead of an entirely new raid, a feature called raid lair was added, featuring new areas to the existing Leviathan raid and a different final boss. The second expansion, Warmind, was released on May 8, 2018 and focuses on the Warmind Rasputin from the original game. This expansion takes players to the planet Mars in a new area called Hellas Basin. The expansion also features a new mode called "Escalation Protocol", a horde mode which can be started by any player in the patrol mode on Mars. As well, the EXP level cap was raised to 30 and the Power level cap was raised to 380. In addition to Rasputin, a new character named Ana Bray (also from the lore of the original Destiny) was added, who serves as the primary NPC on Mars. Like the previous expansion, Warmind also includes a second raid lair on the Leviathan. The expansion also added progressive ranking systems for PvP, titled Valor and Glory. Players earn Valor in quickplay matches while Glory is earned in competitive matches, with each new rank earning greater rewards. Valor points are earned regardless of win or loss, while Glory points are earned by wins but reduced by losses. Both expansions featured timed-exclusive content for the PlayStation 4 platform. "The Dawning" holiday event from the original Destiny returned on December 19, 2017 and ended on January 9, 2018. Both social spaces were redecorated for the event along with snow weather. Players could create snowballs in the social spaces and during strikes and throw these at other players or enemies (which damaged enemies). The Crucible game mode "Mayhem" (all abilities restore rapidly) was also brought back from the original Destiny. New Milestones with event-themed rewards were also added. "Crimson Days", the Valentine's Day-themed event from Year 2 (2016) of the original Destiny, returned for Destiny 2 on February 13, 2018, and like the original, it ran for only one week. Just as in the original event, Crimson Days featured a 2-versus-2 Crucible mode–the only in Destiny 2–however, the mode was modified from the original. Staying close to a teammate caused all abilities to recharge quicker, while being apart gave away both players' locations to the opposing team. Players could earn Crimson Engrams, granting new rewards. Crimson Days was later rebranded into a separate but permanent mode called "Doubles" as a rotating mode in the Crucible. A brand new summer event called "Solstice of Heroes" began on July 31, 2018 and ended on August 28, 2018, to commemorate the first year of the game. The Power level cap was raised to 400 for the event. A new NPC called the Statue of Heroes was added and provided bounties that, when turned in, awarded Moments of Triumph points for players which can be used to earn exclusive rewards. Players received "Scorched" armor pieces at Power level 240 at the start of the event, which can then be upgraded to "Rekindled" armor at Power level 340, then to "Resplendent" armor at Power level 400, all by completing specific requirements for each armor piece, including playing through 5 revamped (Redux) missions from the original Destiny 2 campaign. Players could also earn Solstice Engrams, which also granted new rewards. Destiny 2 received "generally favorable" reviews, according to review aggregator Metacritic. Some reviewers labeled the game as Destiny 1.5 due to its many similarities to the original Destiny, but praise was given to improvements made over its predecessor. Destiny 2 sold 50,263 copies on PlayStation 4 within its first week on sale in Japan, which placed it at number one on the weekly sales charts. The weekend consisting of September 23, Destiny 2 took the number 1 spot on the UK sales chart. Destiny 2 was also the second highest-grossing console game of 2017 in North America (behind Call of Duty: WWII), and was also Activision's biggest PC release based on units sold. Digital downloads for Destiny 2 account for more than half of the total sales of the game. As with the original, gameplay was highly praised, with Chris Carter of Destructoid saying that it was what "the game nails ... the most". Game Informer's Matt Miller said that like the original, "Gameplay features remarkably taut FPS gunplay enhanced with seemingly magical powers." Miller went on to say that the gameplay's biggest change was a welcome, referring to the reorganization of destinations and the emphasis on exploration. Evan Slead of Electronic Gaming Monthly (EGM) also praised the exploration, but was not a fan of the recategorization of the weapons. Although he said the variety of weapons were fun, the Kinetic weapons "didn't seem to pack as much of a punch as their Energy [weapon] counterparts." Cody Perez of Game Revolution, however, welcomed the recategorized weapons, saying they were less restrictive and said that "Bungie are masters of gun-play". Kallie Plagge of GameSpot said that the game features mostly the same structure as the original, including its "mechanically excellent shooting and satisfying loot grind". Carter praised the Lost Sectors and public events, as well as the additional story quests and Adventures post-campaign. Miller said that the Lost Sectors were fun, but they became less interesting with the more that were done. Perez, however, was not a fan of the Adventures and Lost Sectors activities, saying they were a "disconnect [from] the main campaign". He said that they were filler content, and that they were "monotonous and a bore to accomplish, lacking the heart that fills the campaign." He did praise the public events as they are only periodic. The Leviathan raid received praise and criticism. Miller of Game Informer stated that the Leviathan raid was "one of Bungie's most intricate and fascinating environments to date", praising its maze-like structure with hidden chests and secret passages. He was critical of the award system, however, stating that it "separates the excitement of new gear from the moment of victory", as it does not offer most loot until a full completion. Slead of EGM said that "the bread and butter of Destiny is still these post-campaign quests", also referring to Strikes and the weekly Nightfall activity. Perez of Game Revolution, who did not play any of the original game's raids, was a big fan of the Leviathan raid, stating that it exceeded its hype. Plagge of GameSpot said that "solving [the raid's] often obscure puzzles can be both rewarding and frustrating", but "each failure teaches you something new". The original Destiny was largely criticized for its story. Destiny 2, however, was praised for its improvements to the story and easier access to the universe's lore. Slead of EGM said that it has a "more robust story" and Bungie fixed the "meandering storytelling from the first". Carter of Destructoid said that although its story was similar to others in the same genre, "it's easy to follow and even easier to get invested in, with the game's cast coming front and center." Perez of Game Revolution said that the story "[gripped] me in a way that only Bungie's former series Halo was able to." He said that there were many moments that were of shock and awe, and that the game had a meaningful narrative with an actual fleshed out villain. Plagge of GameSpot said that the story serves its main purpose and that its strength "lie in atmosphere and side details", while also praising its "mournful soundtrack" as fantastic. Miller of Game Informer praised the Crucible mode for feeling more competitive than the original Destiny's, with teamwork being "highly valued". However, Miller was "perplexed by the decision to force players into one of two playlists", instead of letting them choose. He was also indifferent to the change of making all modes four-versus-four, but said that "the compact group size demands everyone pull their weight, which is great." Perez of Game Revolution was disappointed that Crucible did not receive "the same love that the singleplayer had been given." He said that although the smaller map sizes were not a bad thing, it causes multiplayer to be non-stop action, not allowing players to take a moment to strategize. David Houghton of GamesRadar+ said that the changes to the Crucible mode "shine in a tight, focused, clear, and tactically co-operative format." For the 2017 Game Critics Awards, it was awarded Best PC Game for E3 2017. At The Game Awards 2017, Destiny 2 was one of four games to receive six nominations, the most for the year's event, which were for Best Art Direction, Best Score/Music, Best Audio Design, Best Ongoing Game, Best Action Game, and Best Multiplayer. Entertainment Weekly ranked Destiny 2 sixth on their list of the "Best Games of 2017", GamesRadar+ ranked it seventh on their list of the 25 Best Games of 2017, and Eurogamer also ranked it seventh on their list of the "Top 50 Games of 2017", while Polygon ranked it 12th on their list of the 50 best games of 2017, and The Verge named it as one of their 15 Best Games of 2017. In Game Informer's Reader's Choice Best of 2017 Awards, the game came in second place for "Best Co-op Multiplayer" and for "Best Shooter". The website also gave it the "Best Weaponry" and "Best Gunplay" in their 2017 Shooter of the Year Awards. Ben "Yahtzee" Croshaw of Zero Punctuation, on the other hand, ranked the game third on his list of the Blandest Games of 2017, stating, "I always feel slightly unqualified to criticize multiplayer-focused shooters, which are, after all, intended to be bland and for people with friends, but I can't help feeling that the best possible result of enlisting friends to help you grind through Destiny 2 would be not having to pay for as many Christmas presents." Destiny 2 was nominated for "Best PC Game" in both Destructoid's Game of the Year Awards 2017 and IGN's Best of 2017 Awards, the latter of which also nominated it for "Game of the Year", "Best Xbox One Game", "Best Shooter", "Best Graphics", "Best Original Music", and "Best Multiplayer". The game won the award for "Best Co-op Game" in PC Gamer's 2017 Game of the Year Awards, and received a nomination for "Game of the Year". It was also a runner-up each for "Best-Looking Game", "Best Multiplayer", and "Game of the Year" in Giant Bomb's 2017 Game of the Year Awards. ^ Additional work on PC version was provided by Vicarious Visions. High Moon Studios provided development support on downloadable content. ^ Weber, Rachel (May 18, 2017). "Bungie Embraces PC With 'Destiny 2'". Glixel. Retrieved May 19, 2017. ^ Schreier, Jason (March 30, 2017). "Destiny 2 Officially Revealed, Confirmed For PC". Kotaku. Retrieved March 30, 2017. ^ a b c d e f g Slead, Evan (September 14, 2017). "Destiny 2 review". Electronic Gaming Monthly. Retrieved September 14, 2017. ^ a b c d e f Perez, Cody (September 13, 2017). "Destiny 2 Final Review – What Destiny Should've Been". Game Revolution. Retrieved September 13, 2017. ^ a b Good, Owen. "Bungie Reveals its Destiny in This Documentary". Kotaku. Kotaku. Retrieved February 25, 2013. ^ a b c d Espineli, Matt; Plagge, Kallie (May 17, 2017). "Destiny 2: Everything We Know So Far". GameSpot. Retrieved June 7, 2017. ^ a b c d Tapsell, Chris (May 26, 2017). "Destiny 2 classes and subclasses - all new Titan, Hunter, and Warlock skills and supers explained". Eurogamer. Retrieved June 8, 2017. ^ a b c d e f g Reynolds, Matthew (June 9, 2017). "Destiny 2 gameplay changes, beta, release date and everything else we know so far". Eurogamer. Retrieved June 9, 2017. ^ Albert, Weston (June 2017). "Destiny 2 Has A New Weekly Activity Called 'Flashpoints'". Game Rant. Retrieved September 8, 2017. ^ a b Gilyadov, Alex (September 22, 2017). "Destiny 2: Bungie Explains New Faction Rally Event". IGN. Retrieved September 28, 2017. ^ Newhouse, Alex (May 18, 2017). "Destiny 2 Limits Competitive Multiplayer To 4v4". GameSpot. Retrieved June 8, 2017. ^ Ibañez, Gregory (May 19, 2017). "Destiny 2's New PVP Mode Countdown is Basically Counter-Strike with Revives". PVP Live. Retrieved June 8, 2017. ^ Gurwin, Gabe (September 7, 2017). "Dominate Multiplayer With Our 'Destiny 2' Crucible Guide". Digital Trends. Retrieved September 9, 2017. ^ Albert, Weston (September 8, 2017). "Destiny 2 Details Trials of the Nine Debut [UPDATED]". Game Rant. Retrieved September 9, 2017. ^ Pereira, Chris (September 15, 2017). "Destiny 2: What Is Trials Of The Nine? How To Get Started". GameSpot. Retrieved September 15, 2017. ^ a b Pereira, Chris; Makuch, Eddie (October 7, 2017). "Destiny 2: Iron Banner Gear Rewards, When It Starts, What's New, And How To Access It". GameSpot. Retrieved October 8, 2017. ^ Thier, Dave (November 4, 2014). "'Destiny' Sequel Already In The Works". Forbes. Retrieved January 25, 2015. ^ a b Hussain, Tamoor (January 22, 2016). "Destiny 2 Not Launching September 2016, Report Says". Forbes. Retrieved January 24, 2016. ^ DeeJ (February 11, 2016). "This Week At Bungie – 02/11/2016". Bungie. Retrieved February 11, 2016. ^ Dyer, Mitch (February 11, 2016). "Destiny 2 in 2017, 'Large New Expansion' Coming to Destiny 2016". IGN. Retrieved February 11, 2016. ^ Skrebels, Joe (February 16, 2016). "Destiny's new writer proves Bungie is finally taking its story seriously". GamesRadar. Retrieved February 18, 2016. ^ McWertor, Michael (December 8, 2016). "Destiny development team expands with Vicarious Visions". Polygon. Vox Media. Retrieved December 11, 2016. ^ a b Makuch, Eddie (February 9, 2017). "Destiny 2 Still Coming In 2017; New Call Of Duty Goes "Back To Its Roots"; Infinite Warfare Underperforms". GameSpot. Retrieved February 9, 2017. ^ a b c Sarkar, Samit (March 30, 2017). "Destiny 2 launching Sept. 8, watch the reveal trailer". Polygon. Retrieved March 30, 2017. ^ Kuchera, Ben (December 9, 2014). "Destiny players: Keep grinding, your progress will carry into sequel". Polygon. Vox Media. Retrieved January 25, 2015. ^ Destiny Dev Team (March 3, 2017). "The Road Ahead". Bungie. Retrieved March 3, 2017. ^ Jason Schreier (March 23, 2017). "Leaked Image Gives A First Look At Destiny 2, Out This September". Kotaku. Retrieved March 23, 2017. ^ Destiny The Game (March 27, 2017). "Destiny 2". Twitter. Retrieved March 27, 2017. ^ Pereira, Chris (March 28, 2017). "Destiny 2 Will Have PS4-Exclusive Content For A Limited Time". GameSpot. Retrieved March 28, 2017. ^ Harradence, Michael (March 30, 2017). "Destiny 2 confirms return of Nolan North as teaser trailer debuts". PlayStation Universe. Retrieved March 31, 2017. ^ DeeJ (March 30, 2017). "Destiny 2 Coming to PS4 September 8, Watch the Reveal Trailer". PlayStation.Blog. Retrieved March 30, 2017. ^ Skrebels, Joe (May 19, 2017). "'No Plans' for Destiny 2 on Nintendo Switch". IGN. Retrieved July 3, 2017. ^ McCaffrey, Ryan (July 21, 2017). "Ask Bungie Anything About Destiny 2 - IGN First". IGN. Retrieved September 6, 2017. ^ Issac, Ashish (November 10, 2017). "Destiny 2 Upcoming Update Adds HDR Support And "4K" Resolution For Xbox One X". GamingBolt. Retrieved November 11, 2017. ^ Thier, Dave (June 13, 2017). "'Destiny 2' Will Run At 30 FPS On Xbox One X". Forbes. Retrieved September 6, 2017. ^ Newhouse, Alex; Fillari, Alessandro (June 12, 2017). "E3 2017: New Destiny 2 Cinematic Trailer Shows Strong Story Focus". GameSpot. Retrieved June 13, 2017. ^ a b Dayus, Oscar (June 12, 2017). "E3 2017: Destiny 2's Release Date Moved Forward (A Bit)". GameSpot. Retrieved June 13, 2017. ^ Dayus, Oscar (June 14, 2017). "E3 2017: Destiny 2 Beta Date Confirmed, PC Version Coming Later". GameSpot. Retrieved June 14, 2017. ^ a b Makuch, Eddie (September 15, 2017). "Destiny 2's Awesome Soundtrack Is Out, Listen To It Here". GameSpot. Retrieved May 1, 2018. ^ a b Makuch, Eddie (March 30, 2017). "Destiny 2 Cayde-6 Figure Available At GameStop With Preorders". GameSpot. Retrieved March 31, 2017. ^ Pereira, Chris (September 6, 2017). "Destiny 2: How To Get Coldheart And Other Limited Edition And Pre-order Bonus Items". GameSpot. Retrieved September 6, 2017. ^ Makuch, Eddie (March 30, 2017). "Destiny 2 Lord Saladin And His Wolves Figure Revealed". GameSpot. Retrieved March 31, 2017. ^ "Destiny 2 is coming to Blizzard's Battle.net". Polygon. Vox Medi. Retrieved May 18, 2017. ^ Makuch, Eddie (January 10, 2019). "Destiny 2 Will Stay On Battle.Net After Bungie's Split From Activision". GameSpot. Retrieved January 10, 2019. ^ Krupa, Daniel (June 12, 2017). "E3 2017: Destiny 2 PS4-Exclusive Content Detailed". IGN. Retrieved June 14, 2017. ^ Pereira, Chris (March 30, 2017). "Destiny 2 Release Date, PC Version, And Collector's Edition Announced". GameSpot. Retrieved March 30, 2017. ^ Hussain, Tamoor (July 10, 2017). "White PS4 Pro Will Launch With Destiny 2 Bundle". GameSpot. Retrieved September 2, 2017. ^ Makuch, Eddie (September 7, 2017). "Destiny 2's Clan Features Won't Work In-Game For "Several Days" After Launch". GameSpot. Retrieved September 7, 2017. ^ Makuch, Eddie (September 6, 2017). "Destiny 2 Release Date On PS4 And Xbox One, Raid And Nightfall Debuts Confirmed". GameSpot. Retrieved September 7, 2017. ^ Makuch, Eddie (October 7, 2017). "Destiny 2's Prestige Raid For Leviathan Unlocks Next Week". GameSpot. Retrieved October 8, 2017. ^ Newhouse, Alex (December 19, 2017). "Destiny 2's Holiday Event Is Now Playable On PS4, Xbox One, And PC". GameSpot. Retrieved December 20, 2017. ^ Pereira, Chris (February 13, 2018). "Destiny 2 Crimson Days Launches With New Update On PC, PS4, And Xbox One". GameSpot. Retrieved February 13, 2018. ^ a b "Destiny 2 for PC Reviews". Metacritic. Retrieved February 12, 2018. ^ a b "Destiny 2 for PlayStation 4 Reviews". Metacritic. Retrieved September 18, 2017. ^ a b "Destiny 2 for Xbox One Reviews". Metacritic. Retrieved September 18, 2017. ^ a b c d Carter, Chris (September 11, 2017). "Review: Destiny 2". Destructoid. Retrieved September 11, 2017. ^ a b c d e Miller, Matt (September 15, 2017). "A Streamlined Future - Destiny 2 - PlayStation 4". Game Informer. Retrieved September 15, 2017. ^ a b c d Plagge, Kallie (September 15, 2017). "Destiny 2 Review". GameSpot. Retrieved September 15, 2017. ^ a b Houghton, David (September 15, 2017). "Destiny 2 review: 'This isn't Destiny. This is something new. Something bigger, smarter, richer, and better'". GamesRadar+. Retrieved September 15, 2017. ^ Shoemaker, Brad (September 18, 2017). "Destiny 2 Review". Giant Bomb. Retrieved September 18, 2017. ^ Legarie, Destin (September 15, 2017). "Destiny 2 Review". IGN. Retrieved September 15, 2017. ^ Sarkar, Samit; Frushtick, Russ (September 20, 2017). "Destiny 2 review". Polygon. Retrieved September 20, 2017. ^ Bell, Alice (September 15, 2017). "Destiny 2 review". VideoGamer.com. Retrieved September 15, 2017. ^ Romano, Sal (September 13, 2017). "Media Create Sales: 9/4/17 – 9/10/17". Gematsu. Retrieved September 13, 2017. ^ Hussain, Tamoor (September 25, 2017). "Top 10 UK Sales Chart: Destiny 2 Continues Its Dominance". GameSpot. Retrieved September 27, 2017. ^ Gilyadov, Alex (December 20, 2017). "Call of Duty: WWII, Destiny 2 Top U.S. Sales for 2017". IGN. Retrieved April 25, 2018. ^ "More than half of Destiny 2's console sales were digital downloads". Eurogamer.net. Retrieved April 25, 2018. ^ Perez, Cody (September 13, 2017). "Destiny 2's Leviathan Raid Exceeds the Hype". Game Revolution. Retrieved December 11, 2017. ^ a b "Game Critics Awards: Best of E3 2017 (2017 Winners)". Game Critics Awards. Retrieved December 11, 2017. ^ a b Makuch, Eddie (December 8, 2017). "The Game Awards 2017 Winners Headlined By Zelda: Breath Of The Wild's Game Of The Year". GameSpot. Retrieved December 8, 2017. ^ GamesRadar staff (December 22, 2017). "The best games of 2017: Page 2". GamesRadar+. Retrieved March 25, 2018. ^ Polygon staff (December 18, 2017). "The to best games of 2017". Polygon. Retrieved February 13, 2018. ^ Game Informer staff (January 4, 2018). "Reader's Choice Best of 2017 Awards (Page 2)". Game Informer. Retrieved January 9, 2018. ^ Game Informer staff (January 4, 2018). "Reader's Choice Best of 2017 Awards (Page 3)". Game Informer. Retrieved January 9, 2018. ^ Bertz, Matt (January 6, 2018). "The 2017 Shooter of the Year Awards". Game Informer. Retrieved January 9, 2018. ^ Carter, Chris (December 12, 2017). "Nominees for Destructoid's Best PC Game of 2017". Destructoid. Retrieved January 3, 2018. ^ "Best of 2017 Awards: Best PC Game". IGN. December 20, 2017. Retrieved January 1, 2018. ^ "Best of 2017 Awards: Game of the Year". IGN. December 20, 2017. Retrieved January 1, 2018. ^ "Best of 2017 Awards: Best Xbox One Game". IGN. December 20, 2017. Retrieved January 1, 2018. ^ "Best of 2017 Awards: Best Shooter". IGN. December 20, 2017. Retrieved January 1, 2018. ^ "Best of 2017 Awards: Best Graphics". IGN. December 20, 2017. Retrieved January 1, 2018. ^ "Best of 2017 Awards: Best Original Music". IGN. December 20, 2017. Retrieved January 1, 2018. ^ "Best of 2017 Awards: Best Multiplayer". IGN. December 20, 2017. Retrieved January 1, 2018. ^ PC Gamer staff (December 20, 2017). "Best Co-op Game 2017: Destiny 2". PC Gamer. Retrieved December 31, 2017. ^ Giant Bomb staff (December 25, 2017). "Game of the Year 2017 Day One: Old, Disappointing, Shopkeepers, and Looks". Giant Bomb. Retrieved January 1, 2018. ^ Giant Bomb staff (December 26, 2017). "Game of the Year 2017 Day Two: Music, Surprise, Multiplayer, and Mess". Giant Bomb. Retrieved January 1, 2018. ^ Giant Bomb staff (December 29, 2017). "Game of the Year 2017 Day Five: Best, Worst, Cast, and Capture". Giant Bomb. Retrieved January 1, 2017. ^ Khan, Zubi (August 21, 2017). "Gamescom 2017 Award Nominees". CGM. Retrieved January 22, 2018. ^ "Super Mario Odyssey sweeps Best Of Gamescom awards". Metro. August 24, 2017. Retrieved January 22, 2018. ^ Gaito, Eri (November 13, 2017). "Golden Joystick Awards 2017 Nominees". Best in Slot. Retrieved January 1, 2018. ^ "Nommés aux Ping Awards 2017" (in French). Ping Awards. 2017. Retrieved December 11, 2018. ^ Whitney, Kayla (January 25, 2018). "Complete list of winners of the New York Game Awards 2018". AXS. Retrieved January 28, 2018. ^ Giardina, Carolyn (January 16, 2018). "Visual Effects Society Awards: 'Apes,' 'Blade Runner 2049' Lead Feature Nominees". The Hollywood Reporter. Retrieved February 3, 2018. ^ Makuch, Eddie (January 14, 2018). "Game Of The Year Nominees Announced for DICE Awards". GameSpot. Retrieved January 18, 2018. ^ "Nominee List for 2017". National Academy of Video Game Trade Reviewers. February 9, 2018. Retrieved February 15, 2018. ^ McNeill, Andrew (January 31, 2018). "Here Are Your 2018 SXSW Gaming Awards Finalists!". SXSW. Retrieved February 1, 2018. ^ Makuch, Eddie (March 22, 2018). "Legend Of Zelda: Breath Of The Wild Wins Another Game Of The Year Award". GameSpot. Retrieved March 22, 2018. ^ "2018 Awards". Game Audio Network Guild. Retrieved April 14, 2018. ^ "Vote in the 2018 ASCAP Composers' Choice Awards!". American Society of Composers, Authors and Publishers. April 9, 2018. Retrieved April 23, 2018. ^ ASCAP (May 24, 2018). "Prolific Film Composer John Powell Recognized With ASCAP Henry Mancini Award; Composer And Songwriter Germaine Franco Receives ASCAP Shirley Walker Award At 2018 ASCAP Screen Music Awards". PR Newswire. Retrieved May 24, 2018. ^ Watts, Steve (July 2, 2018). "Resident Evil 2 Wins Top Honor In E3 Game Critics Awards". GameSpot. Retrieved July 3, 2018. ^ Ramée, Jordan (August 15, 2018). "Gamescom 2018: Award Nominees Include Marvel's Spider-Man, Assassin's Creed Odyssey, And More". GameSpot. Retrieved August 16, 2018. ^ Keane, Sean (August 22, 2018). "Gamescom 2018 award winners include Marvel's Spider-Man, Super Smash Bros. Ultimate". CNET. Retrieved August 24, 2018. ^ Hoggins, Tom (September 24, 2018). "Golden Joysticks 2018 nominees announced, voting open now". The Daily Telegraph. Retrieved October 6, 2018. ^ Trent, Logan (February 11, 2019). "Here Are Your 2019 SXSW Gaming Awards Finalists!". South by Southwest. Retrieved February 15, 2019. ^ "Vote in the 2019 ASCAP Composers' Choice Awards!". American Society of Composers, Authors and Publishers. April 2, 2019. Retrieved April 22, 2019.